We are a local Karate club that has been teaching traditional Karate, Martial Arts & Self Defence classes to the people of Wakefield and surrounding areas since 1968. We are one of the oldest and best established Karate clubs around and our instructors have decades of experience in teaching the martial arts. You will find plenty of information about our classes on this website but the best way to find out what we are about is to see for yourself. So please accept our invitation to come along and have a look, we will be happy to answer any questions you may have and if you want to give it a try your first session is FREE so what do you have to lose? In addition to traditional Karate, many of our instructors also hold Black Belts in other martial arts so we can also offer the opportunity to train in other styles such as, Ju Jitsu, Kickboxing and Okinawan Weaponry. We are one of the most established and respected clubs around, running since 1968. We offer something for everyone, we have kids, teenagers, adults and pensioners all training together. We combine traditional Karate training with proven modern teaching methods, our instructors are always looking for new ways to improve our sessions. We teach practical self defence for both kids and adults, designed to help you defend against a larger stronger opponent. Your children benefit from improved concentration, learn important leadership & team work skills. We don’t have contracts or direct debits, you simply pay as you train. 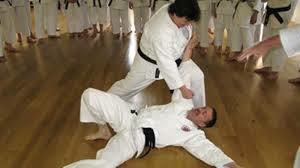 We teach non-violent methods of dealing with bullying. We are a very friendly club with regular social events for both kids & adults. We offer regular courses and tournaments for students to take part in. Most of all because it is fun and you will meet some great people. Our children’s classes are designed to produce polite well disciplined children, that learn in a friendly and enjoyable environment. All our instructors are qualified, insured, first aid trained and DBS cleared for your piece of mind. We are here to encourage your children to progresses to black belt and beyond, but also to give them the life skills and confidence they will need as they get older. Special needs are not a problem we have experience working with a wide variety of children and adults with a wide range of requirements, everyone is welcome. Come and take the first step today, it could change your life!